Sourcing organic fruit and vegetable ingredients can be tricky. A lot of work goes on behind the scenes to find the ingredients that best fit your production requirements. How you undertake this task has an impact on your supply chain risk. Whether you’re new or a seasoned fruit buyer, remembering these four simple tips can help you increase efficiency and reduce risk. 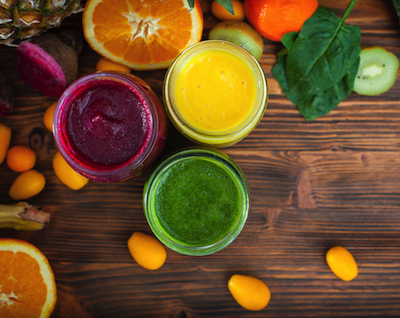 The first thing that is important to remember about sourcing organic fruit and vegetable ingredients is that supply is limited. There is a finite amount of organic certified land in the world – much less than conventional agriculture – and supply is not always enough to meet demand. Booking early reduces your risk by ensuring a supply of the ingredients you need for your products. In some cases, a crop must be reserved before the seeds are even planted. Other crops can be reserved between planting and harvest. Regardless, buyers need to think months ahead. You don’t want to be stuck frantically looking for pumpkin puree at harvest time when the entire crop was booked months ago. Fruits and vegetables are vulnerable to impacts from weather patterns, pests and disease. You’ve heard the saying “don’t put all of your eggs in one basket.” If you only have one source per ingredient and there is a crop shortage in that region, you’re out of luck. Global Organics reduces your supply chain risk even further by validating and verifying all suppliers. Click here to read more. We partner with multiple suppliers for many of our ingredients so you can reduce your supply chain risk. This diversification means you’re more likely to have a backup in an emergency. Sourcing the same ingredient from several places across both hemispheres also helps ensure a year-round supply for seasonal crops. If you are looking to book next year’s crop after the current harvest season has ended, there may not be samples left. Even if samples are available, they will be from the previous crop year. These samples are not necessarily representative of the product you will receive the following season. To secure a portion of the harvest before supplies become scarce, you should make purchase commitments based on product specifications (specs). Contacts are signed “subject to sample approval” and you can review samples later at harvest time. Specs are very important in this process because they are created to encompass the naturally occurring variation in that crop from one year to the next. Depending on the fruit or vegetable you seek, there are different characteristics to list on your spec. We can help you sort out the details upfront to speed up your sourcing process. When we know what you’re looking for, we can connect you with the right product more efficiently. Acidity – Acidity is relevant for several fruits. For example, our organic banana puree can be acidified to various degrees to balance pH for color retention and microbiological stability. Alternatively, apple juice and concentrate come in low, medium and high acid for flavor purposes. Low acid apple juice has little to no flavor and is used as a sweetener whereas high acid juice is very strong and is used for blending. Brix – With single strength puree, puree concentrate, single strength juice and juice concentrate you should specify Brix level. Brix refers to sugar content in the juice or puree concentrate - the higher the Brix the sweeter the puree or concentrate. Cuts – Cut sizes are important for both IQF and dried fruits and vegetables. For example, our organic dried pineapple comes in rounds, half-rounds, chunks (quarter-rounds) and pieces or tidbits. Drying Process – There are a few options to consider when choosing a dried fruit or vegetable. Many products are available air-dried, dehydrated or freeze-dried. Each option produces differences in the flavor and texture of the product. Freeze drying is more expensive but will create a lighter, crisper piece. 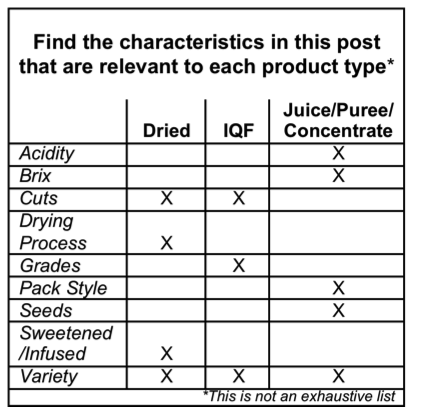 Grades – IQF products come in different grades set by the USDA. The highest is Grade A and is best suited for IQF retail packaging where the other grades are used for purees and concentrates. Pack Style – Purees and concentrates can be packed “fresh-frozen” or aseptic. Frozen packaging increases shelf life and preserves color but products packed in drums require special handling as they take days or weeks to thaw. Once open, drums must be refrigerated and typically should be used within few days to avoid fermentation. Aseptic products are more microbiologically stable due to the aseptic heat treatment and they can be stored ambient, which reduces storage costs. However, color may deteriorate more quickly in ambient storage. A third option is a frozen aseptic product. Storing aseptic products frozen is great for items like red beet concentrate where color preservation is important. Seeds – There may be options for seedless fruit purees. Raspberry is a prime example. If you would prefer a seedless puree, please note this on your spec. Sweetened or Infused – Dried fruits are sometimes available sweetened, unsweetened, and even infused with other flavors like juices, spice blends or cocoa. Variety – Most fruits and vegetables have multiple varieties with different sizes, colors, flavors and textures. For example, there are over 200 varieties of mango but some of the most common are Tommy, Kent, Keitt and Alphonso. Rare or uncommon varieties may offer unique flavors or textures but they can also make sourcing difficult and increase supply chain risk by hindering diversification (see above). Of course, a lot more goes into sourcing fruit and vegetable ingredients but these four tips are a good start. If you have any questions or are looking for a specific ingredient, contact your Account Manager or email info@global-organics.com to discuss your needs.